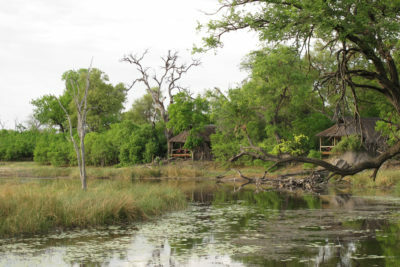 This famous western corner of Chobe is one of Botswana’s best-known wildlife areas. Savuti covers almost 5,000 km2 and includes the Savuti Marsh, Savuti Channel, Mababe Depression and Magwikhwe Sand Ridge. Each of these diverse geographical features is a result of the tectonic instability of the region. Savuti was synonymous with lions and hyenas in the days before the Savuti Channel resumed flowing, and the area now hosts an enhanced diversity of other predators and plains game species. Savuti’s pans, waterholes and channel support an exceptionally large population of bull elephants. Game viewing conditions are generally better in Savuti in the dry season (May to October) when grasses are shorter, vegetation is more thinned out and animals are restricted to available water sources. When dry, the Savuti landscape provides for excellent photography with skeletal trees set against the deep blue sky. The area is particularly photogenic when the plains game begins to move towards the woodlands at dusk and clouds of dust are stirred up against the red sunsets. After the rains arrive in late November, the Savuti area is transformed almost overnight into lush grassland with zebras, wildebeest and buffalo appearing in their thousands. The zebra and wildebeest pass through Savuti on their way south from the Linyanti marshes. The herds remain in Savuti to have their young and feed on the new grasses before moving further on into the Mababe Depression. These same herds then reappear in Savuti later in the season, when they are again passing through on their long migration northwards back to their dry season range along the Chobe and Linyanti Rivers. This zebra-wildebeest migration is one of nature’s great spectacles as well as providing a bounty for predators, which depend upon them to survive: however, the timing of the migration is unpredictable and difficult to catch. The wide-open plains attract cheetah and the various rocky areas around Savuti provide excellent habitat for both leopard and agile klipspringer antelope.